Three new films enter the newly invigorated box office fray this weekend, hoping to further stimulate what’s been a slow fall season so far. Box office got back on track last weekend with Shark Tale and Ladder 49. Can Hollywood continue to keep the ball rolling with Taxi, Friday Night Lights and Raise Your Voice? Taxi, the new comedy from 20th Century Fox, is doing a slow venue-build heading into the weekend. Opening today at about 600 venues, Taxi stars Jimmy Fallon and Queen Latifah, with Fallon recently coming off his last year at Saturday Night Live. Latifah is currently hot stuff at the box office, recently co-starring in Barbershop 2 ($24.2 million opening) and Bringing Down the House ($31.1 million opening). The choice to release this one on Wednesday is interesting considering the questionable word-of-mouth surrounding the film. The Columbus Day holiday lands on Monday (43% of US high school students have Monday off), so Fox must be trying to maximize their profits over six days before audience reception finally kills this one (however, word-of-mouth didn’t kill Bringing Down the House, which went on to make $132.7 million). The top films at the box office have been void of a broad market comedy for quite a few weeks, so audiences may be hungry for anything that’s accessible. I’m expecting a million and a half over Wednesday and Thursday, with another $13 million from Friday-to-Sunday. Two films open Friday and I’ll cover the less-painful one first. Friday Night Lights is a high school football movie from Brian Grazer’s Imagine Entertainment and Universal. It looks like the studio is trying to combine Varsity Blues, Remember the Titans and Hoosiers with this one, which could be quite lucrative for the studio. There's one caveat, though. This type of film most likely won’t work outside of the US. 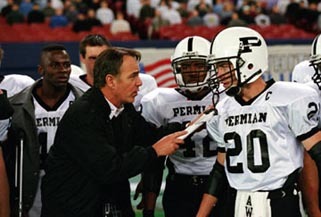 Friday Night Lights stars Billy Bob Thornton as Coach Gary Gaines, who leads a high school football team to the state championships and is based on a true story from a best-selling book. Fellow football movie Remember the Titans found almost $21 million through the strength of the headliner, Denzel Washington, and a tight marketing campaign via Buena Vista. While Friday Night Lights doesn’t quite have the name power as Titans, it is still well-pedigreed. Billy Bob Thornton is coming off the forgettable Alamo and 2003’s Bad Santa, which opened to $12.3 million and finished with $60.1 million. Also starring is country music star Tim McGraw, who will only further solidify a good turnout in the middle part of the continent. The more I see the marketing the more I think this might break out, so I’m looking for a $16 million start. Hopefully for Universal, the large amount of football on TV this weekend doesn’t keep the intended audience at home. The other newbie this weekend is Hilary Duff’s Raise Your Voice, the new cute-fest from America’s (wannabe) Sweetheart. Hilary Duff is as big a threat to the world of entertainment as the Olson Twins are, and this one can sell records. Duff’s first album went triple-platinum in the US alone, so a decision to make a music-filled drama might not be all bad, but it’s at least dicey in the post-Glitter world. New Line probably has an affordable gamble on their hands with this one, and will be happy with an $8 million Friday-to-Sunday gross. In the holdover world, it’s shaping up as an interesting weekend for the two sophomore films, Shark Tale and Ladder 49. Shark Tale should have no problem enjoying a second weekend at number one, but all eyes will be on the percentage drop this weekend. Shark Tale had a huge drop on Monday compared to its Sunday gross, so I have a feeling this one is playing very young. The Columbus Day holiday will help, so I’ll go with a 37% drop to about $30 million. Right now, it’s a battle between DreamWorks and Fox for third spot on the market share chart, with the current difference standing at about $13 million (according to nielsenedi.com). A poor showing for Taxi and another dead weekend for First Daughter could put DreamWorks out in front, at least for now. As for Ladder 49, the Phoenix/Travolta fire fighting flick may get hurt by Friday Night Lights, as both target the same male demo. I’m looking for an approximate 40% drop to about $13 million. New limited release films this weekend include Stage Beauty, the Billy Crudup movie in which he portrays a male actor playing Shakespeare’s heroines in 17th Century London. The Lions Gate release is getting excellent early reviews and opens at three venues in New York. The new drama Around the Bend opens on four screens this weekend; the film stars Michael Caine, Josh Lucas and Christopher Walken and is from Warner Independent. Maybe the most exciting release could be the eerie-looking Primer from ThinkFilm. Primer won the Grand Jury prize at Sundance this year, and looks wickedly weird. It gets a four-venue release in New York and Dallas. In the expanding limited release department, we have two very strong films, one in Walter Salles’ The Motorcycle Diaries, the other in David O. Russell’s I Heart Huckabees. The Motorcycle Diaries has been moving its way up the box office chart, despite being at only 67 venues. The film about the early life of Ernesto 'Che' Guevera earned $1.1 million and a venue average of $16,200 last weekend. Expect more venues this Friday and a top ten finish this weekend. I Heart Huckabees also raised eyebrows last weekend with a $73,044 venue average, albeit from only four screens. A Fox Searchlight press release called it the fifth biggest feature film release of all time (that’s on a per-theatre basis, and excludes animated and IMAX releases – and yes, I know what you’re thinking). Huckabees expands to Boston, Chicago, San Francisco, Washington, D.C., Dallas, Philadelphia, Seattle, Minneapolis, Phoenix, Austin and Portland this weekend – somewhere in the 50-venue range. The $4 million Fox Searchlight Sundance pickup will need a $40,000 dollar venue average to make the top ten, and it just might do that. Check back on Saturday morning to see how the weekend films did on Friday night.